The audio of ‘Theeran Adhigaram Ondru’ is all set to be launched/released on November 2. Are you a fan of the much-loved Karthi? If yes, then get ready to rejoice as we have some awesome news in store for you. In an exciting development, the audio of his eagerly-awaited ‘Theeran Adhigaram Ondru’ is all set to be launched/released on November 2nd. The film’s music has been composed by Ghibran and could turn out to be a delight for fans. In case you did not know, ‘Theeran Adhigaram Ondru’ is touted to be an action-thriller and has been directed by H Vinoth. 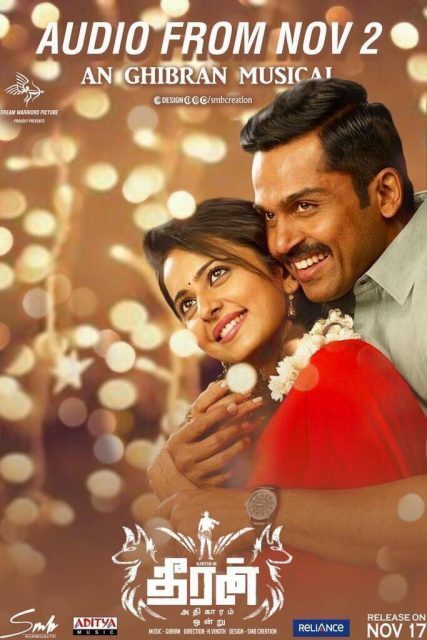 In it, Karthi will be seen opposite the lovely Rakul Preet. While Karthi plays the role of a cop, the lovely lady essays the role of a desi girl. She will be seen in a de-glam avatar here. Sometime ago, Vinoth had said that that he was in awe of Karthi’s dedication as he never sad ‘no’ to anything during the shoot. “We were stuck in windstorms and there was mud and dust all over our body. Many fell sick due to dehydration and few technicians fainted on the sets. We could not have a vanity van for the stars, as they get so hot. But, Karthi stayed focused and used to stand near the monitor prepping for his next scene. I was in awe of his commitment. He is a complete actor,”he had added.